It's a new year and a new moon, and I'm coming back to this blog with great hope + spirit. 2015 was a beautiful year, full of love as well as challenges. I got married, launched a new collection, went to 3 Renegade Craft Fairs, produced 2 massive natural dye studies, and so much more. But it wasn't without its challenges either- the extreme amount of stuff packed into one year left my head feeling burnt out and my creative spirit feeling dull. By the time October rolled around, my creative mojo was at an all-time low, and my soul was hurting. There is no doubt that running your own handcrafted micro-business is an insane amount of work; add all those other major life events, plus running my collective, Parliament, full time, and you've got a perfect recipe for depression + anxiety to take root. Take root they did. The holidays were rough- a lot of demand and stress, self-doubt that despite being at this almost six years I wasn't seeing enough growth to jump-off the limited funding (and low personal paycheck) hamster wheel, accompanied by the always present worry of making enough cash to get through the lean winter months and keep growing in 2016. My personal relationships were suffering and negatively impacted by my anxieties, and those persistent comments from well-meaning family members- "Are you actually making it... You know, without 'assistance'?" "Do you have enough money to buy groceries?" "You got married, but still haven't done thank-you notes and we haven't seen pictures..." all were piling up in a not-positive killer way. But, my friends + family were also listening to my needs. My husband Jake patiently listened to my concerns and when my workload was just too much to continue doing all my Littlewings work as well as my promotional work for Parliament, he stepped into either assist or simply say, "Don't worry about it; Parliament will promote itself enough through our individual efforts." My own parents were divided in the type of support they offered- my Dad expressed outrage that I might consider quitting now, and my Mom was quietly pragmatic that if I felt I wasn't able to meet my financial responsibilities, then it was time to look for other work. And my best friend and business partner Megan stuck to her guns- I had made a commitment to Parliament and like everyone else, I was going to be in this for the next 1.5 years of the studio lease, even if it meant bankruptcy or worse- there was no other choice. Most of this felt really awful. I was supposed to be an example of how you can make it as a micro-business, having been a full-time maker + business owner in my community for so many years; but mentally, spiritually, and emotionally, I was falling to pieces. In October, I had a really rough patch, right after ArtPrize and with the holiday season looming ahead as a source of doom rather than excitement. At his wits end of how to help, Jake called one of my friends and bridesmaids, Ashley, to see I could get together with her for a sister-day and a spiritual guidance session. When I met Ashley a couple years ago, she was really my opposite in a lot of ways- I was all business and operating out of my head, putting logic ahead of all else, analyzing everything for a profit- she was all heart, allowing her intuition and gut to guide her life. On the surface, I was a tough little nugget and she was all woo; on a deeper level, we connected in so many ways, as independent makers, thinkers, dreamers, and artists. I have been writing daily in my gratitude journal for several months, but my Session on January 8th was definitely a break-through day. I went out to her farm for a long session- we discussed my struggles, she led me in a guided meditation, we stretched, and she even read my cards (something I had always scoffed at previously but looked at differently when she explained that it wasn't so much a literal "reading of the future" as it was a symbolic guideline for dissecting the problems that start at the top of the mind.) That day, she began to gently guide me toward a life that leads with the heart and focuses on loving myself first so that I can love + serve others better. Her wisdom and insight noticed that in all my overwhelm of constant work + projects, my spiritual health was being consistently ignored, and encouraged me to give it dedicated time through meditation and yoga. With a hope that at the very least, this would help stretch my body during the grueling months of production ahead, I began a daily practice. I built a little alter with a mirror so I could make sure I was stretching correctly, and even if my head was full of screaming harpies, I sat on my yoga mat in silence and breathed and stretched, and journaled on the daily. 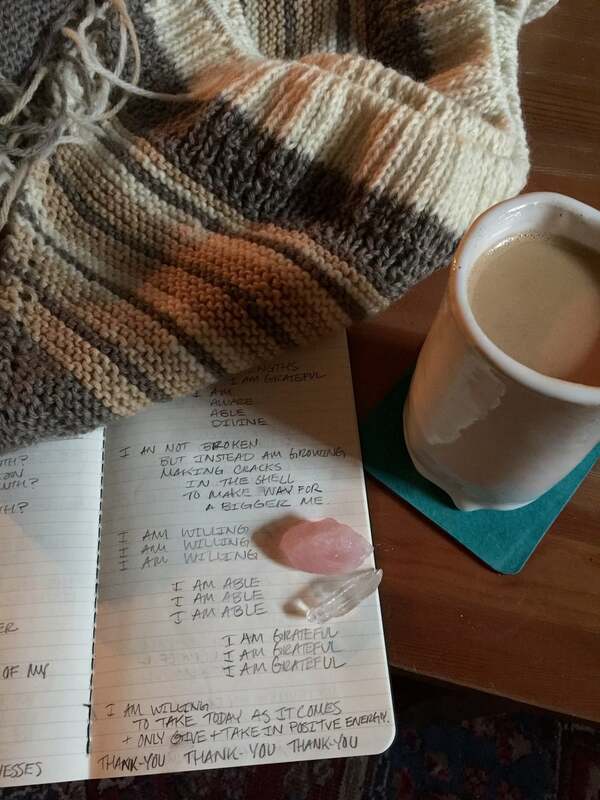 This was my saving grace during the holidays, stretching out the day's work, examining my body's capability and function, and journaling my daily gratitude and heart-work. My daily spiritual practice, which I dubbed "Sessions," was my life-line. I made a determination for myself in November as all of this was snow-balling- I would get through Christmas Eve, and then not work until January 7th, the beginning of Epiphany and my personal end of the holiday season. Regardless of where the bank account landed at the end of the year, I would take those two weeks to truly recharge, and formulate a plan for 2016. I would actually relax- not check email, not worry about bills, not chase down those "after Christmas" sales opportunities that would creep into my time off and eradicate my vacation. And that is what I did. Three Christmases with my families, three original Star Wars movies, two times seeing the Force Awakens, many days with my sister at my house as my official "loafing consultant," one hella New Year's Eve party, and many hours of stretching, meditation, and journaling. My heart-work during my sessions was critical- thinking about letting my heart and love be the driving force behind my life rather than my head and business. I am a human, not a machine; I am more than I brand. I am a soul, voice, wife, friend, sister, maker + dreamer. My daily life needed to reflect this- I cried into the silence and quagmire of anxiety, asking the universe to show what path would lead me to my dreams of security and serenity. Would anything alleviate this anxiety? Was there another dream I was meant to pursue? But there is nothing else that feels more right than being a maker, and I struggled to find any path beside the one I've been upon so long. On Wednesday, January 6th, we moved our office to the studio and I also got walloped with a nasty cold. I was supposed to go back to work on the 7th, but instead I was in bed in a 'Quil induced haze, with little to do but drift in and out of restless sleep and cruise the Internet. And it was then, that my Epiphany of Three began to come into my life. 1. I discovered a book called "The Evolutionary Guidebook," via my dear friend Ashley and her recent adventures in meeting the author. I had seen the book previously on Amazon, but had refrained from buying it due to budget; this time, it reappeared in my life as a free e-book. I downloaded it and began to read- and realized I had found something profoundly life-altering. I have never been a traditionally religious person, and had many experiences growing up in a very conservative community that pushed me away from the standard sources of spiritual guidance. I wasn't looking for a church or a small group; I was seeking something that felt authentic and free of judgement, something that transcended "religion" and the mire of disagreement that comes with it. While my own Sessions were leading my towards inklings of the heart and putting love first, it all felt like grasping at wisps of fog; this little book lays out such a clear and easy to follow language for spiritual transcendence beyond religion. I am still reading it, and am studying it chapter by chapter. I encourage anyone who is feeling similarly to check out this book- you can download a copy here. 2. I stumbled across a free meditation session at the studio next to mine on Facebook, and wanting some more direction for my sessions, decided to go. It was on Saturday, and was mind-blowing. I am now signed up to take a full-weekend meditation training course in SKY Meditation and am keenly anticipating learning a tangible coping mechanism for my anxiety. While I always have known that breathing was critical to relaxation, plus a scientifically proven tool for helping alleviate anxiety, an education and process for breathing had never occurred to me. I would pay for assistance to my mind and body in many other ways- doctor visits, medications, yoga lessons, etc- so didn't it make sense to receive education in the most fundamental of life necessities, the breath itself? 3. My best friend Megan gave me my Christmas present- a copy of "2016: Your Best Year," by Lisa Jacobs. Is struck me hard; Megan had been listening, and to more than just my anxiety and upset. She had been deeply listening, processing my fears and worries, and actively sought a solution. This amazing gem is a workbook designed for and by the creative entrepreneur, created to help you review your year, balance your personal self with your work self, set goals for the year ahead, and lay out a plan to achieve them. Upon opening the gift, I read the introduction and literally wept; Lisa Jacobs seemed like she was speaking directly to both my head and my heart. It deals so directly with so much of the overwhelm I have been feeling. I am starting this workbook today, and am taking the week to work through it. Part of my anxiety couldn't get past the thought of not just pulling myself up by my bootstraps to do this for another year, but also having to plan the entire thing. This workbook lays out a plan that I don't have to write, and I'm so grateful to both Megan for finding it, and to Lisa for writing it. One of the true struggles of anxiety is it often feels like no one is listening. But these two weeks of time-off have helped me realize something so important- the universe is listening, I just have to listen to it. And my friends + family are listening too, but answers aren't always instant. One must be first ready to hear them. One of my major goals for 2016 is to blog regularly in this space. I used to write a lot, and my Sessions practice has shown me how necessary it is for my brain to properly defragment and process. My personal goals for 2016. Next? I will be blogging a list of personal goals for myself, my journey through "The Evolutionary Guidebook," and my process of completing "2016: Your Best Year." I am willing this blog space to be an open and honest sharing about this life as a maker, dreamer, sister, wife, and last-but-not-least, creative micro-business owner. While I need to write for my sanity and will do it regardless of the whether anyone is listening, I know now that many people are- I invite you to listen and join me on this journey this year!